Semifinal in the WBSS Tournament, defence of the WBO title by Usyk as he won the WBC title from Briedis with a win on scores of 115-113 twice and 114-114. It was fastpaced with Usyk, a southpaw, using his superior reach and outjabbed Briedis. 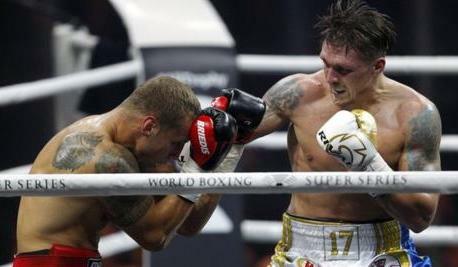 But Usyk´s left was seldom effective and many of his punches lacked power. He fought like the exellent amateur boxer he is while Briedis kept coming, working with fewer but harder punches. As it was Usyk´s volume made a difference and he was a deserved winner but had to work hard to get it in an exellent fight. 58-56 twice fpr Aleksejevs and 58-56 Possiti. Kongolo retained the WBC Int´l Silver title on scores of 98-90, 98-91 and 99-89. Pokumeiko was down in round 7 and then heads clashed, Pokumeiko was cut and Kongolo had a point deducted. Govedarica was down twice from left hook downstairs from his southpaw opponent. 77-75 twice for Nielsen who again was short on stamina and 78-74 for Bolotniks. Kärkkäinen won the vacant BBU title on scores of 80-75 and 77-76 - the third judge had it 78-75 Porozovs. 80-75 v 75-78? Hmmm, desribed as a close fight though with Kärkkäinen´s workrate against Porozovs´ harder punches. Kovacs down twice from bodyshots. Saarinen, a former MMA star, was down in the first but won on his better conditioning and Bartus was closed to being stopped in the fourth. 38-37 on all cards. Ngabu retained the EBU title in this first ever all Belgian EBU title fight. Batello, a good puncher but somewhat fragile, was down twice and the towel came in. Vidal, reigning EBU champ, was all set to fight Sergio Blanco at this venue when Blanco re-retired. Vidal still went through with this non-title tuneup. Mendoza retained the Spanish lightweight title. Krieger won the vacant German bdb title with a come from behind win over Maess, who was floored twice in the eighth. Gachegiladze was retired by his corner. Torres is of Filippino desecent and is talked about as the Norwegian Pacman.